Reaching back to a tent restaurant erected there in 1919, Lexington brands itself, at least in part, the “barbecue capital” of North Carolina, a state with considerable heritage in that regard. But it was a tragic train accident eight years earlier that occurred between that would-be tent site and what is now High Rock Lake that is more symbolic for tourism historically across the nation. But it seems that wherever I’ve lived, including my native Yellowstone-Teton nook of Idaho, I’ve crossed paths with William F. Cody. It was least expected here in North Carolina as I began what would be the last half of a four decade career in community destination marketing. When a freight train tragically smashed into one of three trains near Lexington, Cody’s “Buffalo Bill Wild West Show”s (sometimes known by other names) was in the midst of 40 performances throughout North Carolina between 1878 and 1916, including two in Durham where we live. Over 100 horses were killed in the accident, and the vitality of the show that had also performed hundreds of times throughout the country and throughout Europe would never really recover. But it is easily arguable that no other person did more to instill a curiosity for transcontinental travel across the United States in both Americans and those overseas. His attention to detail and authenticity informed expectations. Equally significant, Cody redefined and instilled a deep appreciation for history, culture and artifacts among those living in relatively newly settled lands east of the Hundredth Meridian. He seemed to innately grasp what place branding expert Bill Baker tries to impart wherever he is invited to teach. The brand of a particular place is, in essence, its innate personality. It exists at the intersection of what internal audiences and external audiences perceive it to be. Today, more than ever, it is not something you conjure up or create, it’s simple who and what you genuinely are, something Cody understood was far more appealing than fantasy. In a moment I will share a story or two about how Cody’s influence has helped shape the negotiation of authenticity over the decades about what it is and isn’t western, a negotiation still underway. Cody was born in Iowa in 1846; the year after my ancestors began fleeing across the southern half of that soon-to-be state toward sanctuary in the Rockies. Then his family moved to eastern Kansas where he lost his father. At age 11 he worked as a rider carrying messages between drivers and workers on wagon trains before becoming a bullwhacker, then a trapper, miner and briefly a Pony Express Rider. He enlisted in the Union Cavalry and after the war worked as a buffalo hunter for the railroad. Cody then became a Chief of Scouts for the 5th U.S. Cavalry, leading the rescue of Wild Bill Hickok. Eventually, he earned the Medal of Honor during the Indian Wars. Cody became a public figure and the subject of dime novels as well as outspoken about the rights of Native Americans. In addition, he became a performer and show producer. As a close friend of President Theodore Roosevelt, Cody was also instrumental in the nation’s first national forest and the national reclamation act. The best way to get a sense of William F. Cody is to visit his namesake along the Absaroka Mountains in northern Wyoming as they give way to the Bighorn. Cody, Wyoming is the eastern and to many the most scenic and least touristy gateway to Yellowstone Park. It is also home to the Buffalo Bill Center of the West, which is comprised of four museums including one devoted to Bill Cody’s story as well as a research library. The little town is also home to the still operating Irma Hotel which Cody co-founded a year after that train wreck back in North Carolina. He began by acquiring and then expanding the T E Ranch up the more secluded South Fork from Cody in 1895 and then built a hunting lodge up on the North Fork where the road now leads to Yellowstone since the dam was built. But Cody first saw the potential of this area in 1870 while leading a scientific expedition up the Bighorn. It happened to be the same year an expedition was being led to examine the potential of Yellowstone. Until then, exploration of river valleys along the Rockies such as the Henry’s Fork where my ancestors would settle were dismissive of any settlement potential. But fresh eyes such as Cody’s changed all of that. William F. Cody had a sense of authenticity that has inspired 150 years of nomenclature about the old West and is preserved today in details and artifacts such as clothing and dress and speech. His shows inspired audiences to travel and to know what to expect. They also helped negotiate what experts call the ongoing interplay and socially-agreed upon construct that we designate as authentic. Tourism faces much courser fault lines than just authenticity today. Take for instance, the one that exists between commercial hucksterism and genuine sense of place. The West does too, and not just recently with standoffs by a few militants in Nevada and Oregon. In 1939, a movement anchored in the Sheridan Rotary Club began with a threat to secede and break off northern Wyoming including Cody and Yellowstone into the State of Absoroka. The frustration back then, as it had been during the “range wars” 50 years earlier was more about intrastate politics with the federal policies as a surrogate. But as it does today, another fault line separated the views of preservationist northwestern and fossil-fuel driven northeastern Wyoming. I thought of this on a cross country trip through my homeland a few years ago while listening to a story on the radio far more reflective of the West in which I grew up. A rancher down on the South Fork, near Cody’s T E ranch, was out irrigating his hay fields in June of 2013 when he accidentally came between a Grizzly and her cubs. Watch this very short video of this remarkable account and listen carefully to Nic Patrick’s remarks at the end. If you are a regular reader, you may recall that my great-great-great grandfather, Thomas B. Graham, was killed in 1864 by a Grizzly in Cache Valley, Utah under similar circumstances, after having put his rifle down to help my great-great grandfather load some wood. Like many ranchers, Patrick is a conservationist. Also like many ranchers, he has another occupation. For nearly forty years, he and his family have built authentic log homes, often for people who are drawn to live a version of the life Bill Cody depicted. He understands something that William F. Cody came to understand during his lifetime. Tourism can help preserve nature and the things it loves. But unmanaged tourism can also often introduce changes that can kill the very the things it loves. A lot is written today about gentrification of historic neighborhoods. If well-managed so that socio-economic diversity is preserved, it isn’t a problem. If not, the very soul of those neighborhoods and the reasons they became so popular is rapidly hollowed out. 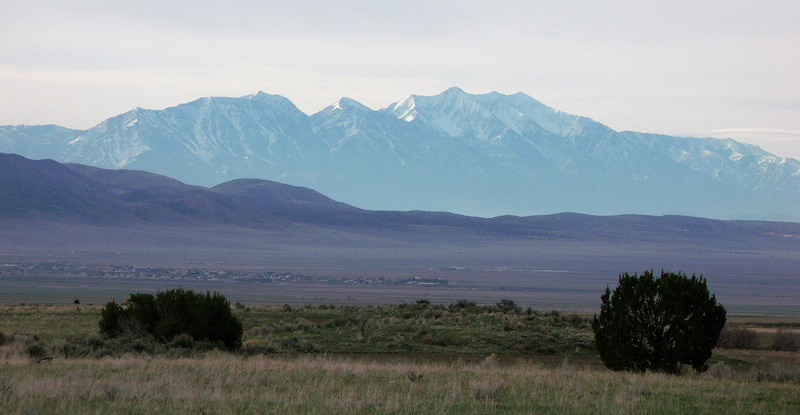 However, gentrification can also occur in areas of the West around public lands. Studies show that for both kinds of gentrification, tourism popularity can provide warning signals to policy makers that they need to instill protections. Unfortunately, tourism circles today have far too few Buffalo Bill Cody’s. Instead of being willing to debate the broader issues society faces, they are prone instead to circle the wagons. From a vista in the center of San Francisco known as Twin Peaks, you can look down on a spot in the Mission District with the Bay glimmering to the east. For a few years in the early 1860s this was known as Camp Alert, a race track-turned-Union Cavalry training facility. I’ve always wondered how Thomas K. Messersmith, one of my maternal great-great grandfathers, who was a fourth-generation Southerner and native Missourian came to enlist to fight for the Union and train there, so far from home. Tracing genealogy is a journey, often beginning by tracking down documentation for family legends. But even when found, each revelation usually still leaves a loose end or two, that once tied open yet another revelation. By the 1860 census, my great-great grandfather, a few weeks shy of 26 years old, was bunking with two other miners who were well into their 30s, T.H. Wilson from Virginia and N.F. Scott from Maryland. They were living in a boarding house in Virginia City, Nevada which was then a part of Utah Territory and the site of the Comstock silver discovery only a few months earlier. I doubt he came out to the California Gold Rush a decade earlier because the census then shows him still at home in Missouri. But Virginia City had not only been named by Southerners, it was a hotbed at the time for secessionists who were gloating at having defeated a proposal for statehood because it included a prohibition of slavery. Because they were born and raised in very different parts of Missouri, I suspect they had formed a bond once Twain arrived in Virginia City with his brother, probably as much over as shared prowess for playing cards as briefly sharing a mining claim. These fragments can be pieced together from references in collections of Twain’s letters from that time, which also confirm that my great-great grandfather would often be referred to be “Smith,” a truncation of his last name, Messersmith, just as my great-grandfather Ralph would later do. This discredits another family legend that the truncation was the result of discrimination during World War I. My great-great grandfather gave up on mining around the time he crossed paths with Twain or shortly thereafter and headed up and over the Sierra Nevada’s and down to Stockton to enlist for the Union on October 3, 1861. Interestingly, Twain had already served a two week stint with a Confederate militia back in Missouri and still had Southern sympathies at the time. This and the dissention back in their home state must have led to some interesting conversations between the two Missourians. The California into which my great-great grandfather rode had been in deep turmoil since a deep spit the year before in the Democratic Party, which had resulted in the election of President Abraham Lincoln with just a third of the vote. Rampant secessionist conspiracies had compromised local militias and more than a few law enforcement official, especially in Southern California, leading to public demonstrations by both sides. At the same time, regular Union Army units were being withdrawn to the east and several new Union regiments of California Volunteers were being enlisted to protect communications and critical ore shipments needed to fund the war effort from sabotage and attack. My great-great grandfather made a conscious decision which to my prior understanding was contrary to his both native state and his friends. But digging further I have learned that it was me that was very much misinformed. It took me a while to track down that he initially enlisted in Company A of the Third Regiment which was an Infantry unit, but that didn’t jive with family legend that he was Cavalry. Nor did the date of that unit’s arrival in Salt Lake and its various assignments align with the date and place he eventually mustered out of the army at the end of his tour. After being outfitted at the Benicia Arsenal, he may or may not have participated with Company A in the Bald Hills uprising that ended at Fort Baker before being transferring to Cavalry. It is more probable that he was moved to Cavalry training in San Francisco almost immediately. A hint is provided in one of Twain’s letters, dated May 17, 1862, where he asks another friend to send a pair of Spanish spurs hanging back in his office out to my great-great grandfather. Between late that summer and early fall, with Cavalry training at Camp Alert behind him, at least a part of my great-great grandfather’s company in detachment with another had joined Col. Patrick Conner in Stockton. From there, along with 1,000 other Cavalry and Infantry, they moved in phases over the Sierra Nevada’s and out into the Great Basin along the Overland Trail. They rode first to Fort Churchill about 30 miles east of Virginia City and then proceeded on to secure Fort Ruby, near, coincidentally, where two other of my great-grandparents would drive stagecoach a few decades later. Eventually, they based at Camp Douglas (later re-named Fort Douglas,) a newly created installation on a bench of the Wasatch Mountains above Salt Lake City, where, again coincidentally, my father would be inducted into the army during WWII. From there, my great-great grandfather’s Cavalry company would deploy to protect wagon routes in mountain valleys to the west where they were under constant attack. This was all during the period when the Pony Express was phasing out and the first Transcontinental Telegraph was being completed along a major freighting corridor to the east carrying bullion and supplies for the war effort. It is hard to relate just how broadly and intensely these facilities were under attack during the Civil War from warring bands of Paiutes and Shoshone-Bannock peoples, stretching in a “T” up the Upper Snake River Valley to what would become my birthplace eight decades later. So I will insert this link as background. Because so much of the family legend surrounding my great-great grandfather’s Union Cavalry experience has now been documented, I have no doubt that one day I will find verification of another part. As the story has been passed down, the scar through his trademark mustache was the result of deflecting a Shoshone arrow that would have struck Colonel Connor. My initial skepticism, at least of this particular hand-me-down family legend, has repeatedly proven groundless so far. When digging into family history it helps to remember that legends are traditional stories regarded as historical but unauthenticated, usually because those details have been lost as the stories were passed down. My great-great grandfather was notoriously quiet and solitary, spending weeks at a time herding sheep up into several of valleys along the Oquirrh Mountains where he had once patrolled near the end of his stint as a Cavalry trooper, including Rush Valley where attacks were especially frequent. He became a Mormon and spent the remainder of his days alongside the very Overland Trail he had help protect as a means to hold the Union together never revealing what I now know of how he came to choose that side. But in researching this blog, I think that has become clear. Missouri, it turns out, may have had a very vocal population who had migrated from slaveholding states but by the time of the Civil War, while a neutral border state, it was firmly Unionist in sentiment. It had its share of secessionist scheming. But given the opportunity to vote for secessionist candidates to a convention, it overwhelmingly instead voted for Unionist representatives who voted 99-1 against secession and 70-23 against solidarity with Southern slave states. Mystery solved at least for my great-great grandfather. Unfortunately, far too many Americans are still fighting that war.